How do I get a library card? Please visit the library to fill out a library card application. You’ll need to show a current ID with your name, photo and address. 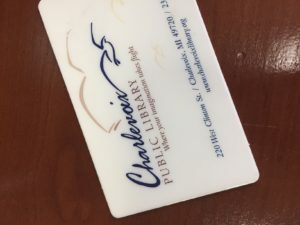 All residents in the City of Charlevoix, Charlevoix School District, Charlevoix, Hayes, Marion, parts of Eveline, Norwood and Banks Townships are eligible for a library card. We also issue cards to anyone who is working in the district. Tell me more about your library.. . 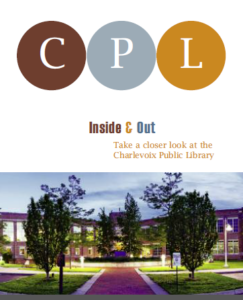 The CPL_Inside & Out Booklet can tell you more about the library, it’s architecture, our services and special features. Can I use a computer? Anyone can use a computer at the library. You can login with your library card number and pin, or get a guest pass. Is there wireless access at the library? Yes. The key to access our wireless account is library! Can I attend activities, programs and events? Yes, anyone can attend our programs and events. Some youth programs are for specific age groups. Who makes up the library district? We have 9,405 residents in our district, including residents in: the City of Charlevoix, the complete townships of Charlevoix, Hayes, Marion, Norwood and portions of Eveline and all of Banks Townships. How is the library funded? The community pays for the operation of the library through taxes. There are two operating mills levied: .46 in perpetuity and .64 through 2024. There is an additional debt millage levied to pay for the debt on the construction of the building. How much did the building project cost? Including purchase of the property, environmental clean-up, demolition, design, construction and interiors – the total project cost $8.4 M. This was funded through a $7.2 M bond sale, grants, and donations. Bonds are scheduled to be fully paid in 2024. UPDATE: The library refunded the bonds in August 2012 with a true interest cost of 2.06% and a savings of $412,000. The total owed at that time was $5.145 M. The bonds will be completely paid off in 2024. Due to the refunding, a lower millage rate will be levied on the tax payers. Work was done 2005-2006. Was this a school? Yes. The building was originally built as the graded school, K-8 grades, designed by Warren Holmes and opened in 1927. When did the new library open? The library opened on September 25, 2006. What is the size of the library? The library is 34,000 square feet. Who painted the mural, Charlevoix – 1927? 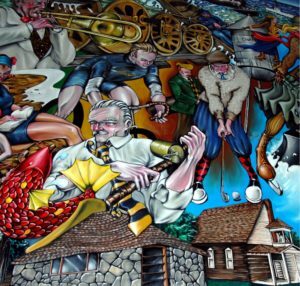 Charles Thompson from Cadillac, MI was commissioned by the Library Board in 2005 to paint the mural. It was meant to depict Charlevoix in 1927, the year the school was originally constructed. What is the name of the color of the two granites in the library? The granite in the restrooms is Lady Dream; the millwork granite is Coffee Brown. Who made the trees in the Youth Area ? Conrad Kaufman. Please visit his website to learn more about him and to see pictures of the trees from the Youth Area at www.fencerows.com. Art in the library? We own several pieces of art in many mediums. Many pieces were done by local artists or donated by local residents. For a full list of art pieces, please visit the Michigan History Room. Ask a librarian to show you the Art Catalog. It is fully indexed for ease of use. When did you get a playground? 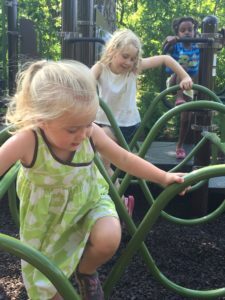 The Brothers Play Lot was installed in July of 2016. It was entirely funded by an anonymous donation. It was named as a memorial to the anonymous donor’s brothers. It has become a gathering spot for families who use the library or are just passing by. Since opening, the library has welcomed more patrons to the “living room of the community,” both in and outside the building. What are the plants inside the round seating wall at the entrance to the library? The two trees are river birch. What tree varieties are on the property? There are many River Birch along the parking lot. The original Oak and Elm trees are still located in the children’s garden. The original Yew at the Mason St. entrance is the oldest tree on the property. There are also Sugar Maples, Honeylocust, and Littleleaf Lindens on the property. The flowering trees include Serviceberry, Cherry and Crabapple. What is the tree at the intersection of the path and the rain garden? The Serviceberry (at the intersection of the path and rain garden) is, planted by the staff and board of the library, in memory of Marti Chester. Who planted the trees for the 2008 Day of Caring? 11 trees, Autumn Blaze Maple and Red Oak, were planted throughout the library property by Mr. Scholten’s (CHS) seminar class for the 2008 Day of Caring. Who did the landscaping at the library? 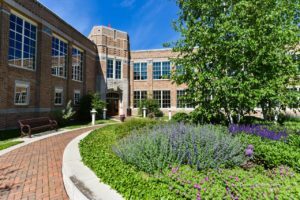 The original landscaping was done by the Mike Hoffman landscape company in Petoskey. 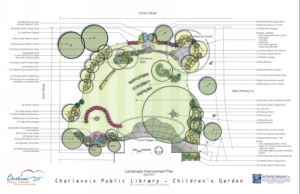 The additional work to enhance the children’s garden and round seating wall was done by Site Planning, Inc., through a generous donation from the Mike and Rhea Dow. What are all the other plantings on the property? The library has many different shrubs, ground covers, and ornamental grasses on the property. The shrubs include: Red Twig Dogwood, Forthergilla, Burningbush, & Butterfly Bush. The Ground Covers are: English Ivy, Lilyturf, Foam Flower, and Periwinkle. The ornamental grasses are: Blue Oat Grass, Japanese Blood Red Grass, & Purple Maiden Grass. How do I know which plant is which? A copy of the landscaping plan is available at the information desk in the adult collection area. What’s the story behind the Butterfly Garden? The Monarch butterfly statue was created by Tom Moran, of Moran Ironworks in Onaway. It was originally part of a rotating public art exhibit in Charlevoix County. One of the library patrons loved it and purchased it for the library. This patron then funded the butterfly garden to surround the statue. The Rain Garden, next to the Butterfly Garden, was one of the first rain gardens in the county. Tip of the Mitt Watershed Council designed and created the garden for the library. For specific information about the garden, see the kiosk by the garden on Clinton Street. 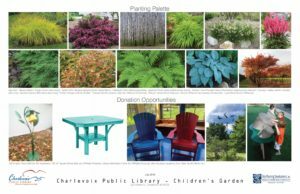 Many thanks to our donors for this project: Mike and Rhea Dow, Debbie and Craig Mann, Larry and Julie Burgess, Leo S. Guthman Fund, Kiwanis of Charlevoix, and the Friends of the Charlevoix Public Library.